I know you must be sick and tired of reading all the posts about the live pigeon shoots in Pennsylvania…I’m sick and tired of it … sad that there is cause to tell you about them. I know that some of you may be feeling helpless because you don’t think there is anything you can do to stop them. Maybe you can’t let yourself think about what happens … it’s just too painful. Whatever the reason…the perpetrators are counting on you to not make a stand. They are counting on you being intimated and sad. They are counting of you pretending it isn’t happening…count on you saying nothing… so they can continue. This Tuesday, February 22nd, there is a protest to the cruel action of live pigeon shoots in Pennsylvania. I realized that most, if not all of you can attend in person, still…there is something you can do to participate. Included in this message are the business emails, for the man that allows the shoots on is private property. The goal is to bombard him with the message that we want the shoots to stop. This is the easy part…all you need to say is this…STOP THE LIVE PIGEON SHOOTS. If you feel you need to say more, please resist making comments that are judgmental or condemning because such comments will take the focus off the goal of stopping the live pigeon shoots. Please protest on behalf of the innocents that have passed because of this cruel action and for those innocents to follow. Remember…they can’t speak for themselves and we are all they’ve got. Please pass this post on to others that will send an email or attend in person. If you cannot attend a protest on Tuesday, then please contact all the Carlton Pools locations on Tuesday, Feb. 22 and politely request that owner Joe Solana stop allowing cruel pigeon shoots on his property. Your support will show Joe Solana and his pals that our compassion and strength far outmatches their cruelty and greed. She said it was OK to share it with you to either send yourself or use as a model for your own. As the long-time owner of a pigeon rescue, I am asking you to stop the live pigeon shoots. You have the power to save innocent and beloved lives. Every being is entitled to live its life in peace and not be the target of such "games" for the fun and amusement of anyone. There is no reason for these shoots to continue and I implore you to do all you can to cease these senseless and cruel events. There is no sport in killing innocent animals for "fun". It is just as fun and challenging to shoot at "clay pigeons" and in such a way allow these amazing birds to continue their precious lives. 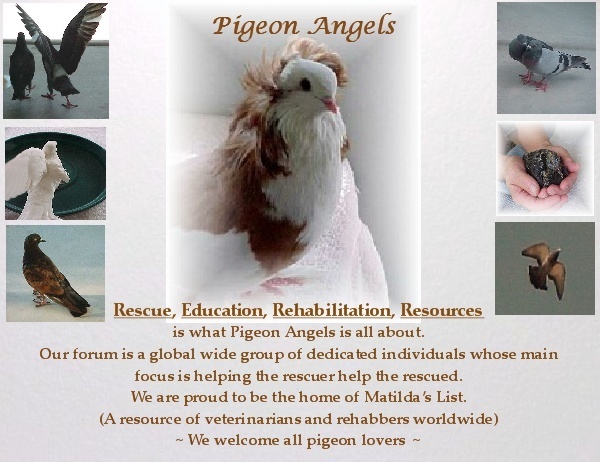 Many of us have "lap pigeons" who are just as sweet and loving as a cat or dog. They spend all of their time and effort in caring about us and each other and bond very strongly to people as well as to their mates. Pigeons mate for life and take equal responsibility for raising their offspring--which is a lesson we as humans can learn from them. They mourn when they lose a mate just as humans do. They have incredible average life spans of twenty years or more and some have been known to live to the age of thirty. They bathe daily whenever possible and can fly at amazing speeds of fifty miles an hour or more. Some are shy, some bold, and some have a wonderful sense of humor, playing games such as hide-and-seek and peek-a-boo with "their" humans. All are proud, unique individuals who deserve to live free of such "games" that cause not only their deaths but also terrible and painful injuries. As someone who has nursed hundreds of injured pigeons back to health, I can assure you they feel pain just as much as you or I, and often it is only their tenacious will to live that allows them to do so after being grievously injured (often in such "sport" as live shoots). Someone on my contact list wrote that letter and told me it was okay to share it...use it or modify it. Really though..this is what I keep thinking about...t think it just as powerful to keep the message short and simple because those receiving the message are the employees of the man that owns the land where the shoots are conducted. This is not going to the shooters but even if it was, the shooters really don't care about how long pigeons live and that they make wonderful companions.... they don't care that pigeons are devoted parents. The shooters would be just as likely to shoot kittens or puppies if they could get away with it. I give a to the creator of that letter. I agree keep the comments short, I'm hoping these people will get knocked on their butts by all the emails, calls & protesting! Unfortunately the shooters think its their god given right to kill harmless animals, these people are just too stupid to think past the end of their rifle barrel. Stop the live pigeon shoots. Great idea, they will be more likely to open it with that heading. I've e-mailed all the addresses. Kept it short, just said the pigeon shoots must stop because they're cruel and degrading, and a stain on PA's reputation abroad. I just sent one of my letters to all email address and found that the one listed below came back as being undeliverable. That one came back to me as well. Jenn said it came back to her too.I wonder if that location has closed down for some reason. A group of pigeon shoot protestors said a man pulled a gun and threatened them after a demonstration outside a Warminster pool company Tuesday. The people from Showing Animals Respect and Kindness (SHARK) showed up at the Carlton Pools shop on York Road in Warminster late Tuesday morning to protest the owner's possession of a sport shooting facility in Hamburg, Pa., where pigeons are tossed into the air in front of waiting sport shooters. But by the end of the day, they said, they were the ones who were looking down the barrel of a gun. Carlton Pools is owned by Joseph Solana Jr., who also owns Wing Pointe in Hamburg. The newspaper was unsuccessful in reaching Solana for comment. Police blocked the entrance to the building Tuesday morning from entry by a newspaper reporter. SHARK president Steve Hindi said after protesting on the sidewalk for about two hours the group was getting ready to leave for lunch when they saw a handful of men in a maroon Ford Expedition speed up to them, cross the path of their vehicle and then pulled up next to them. Hindi said that in the morning someone in an identical vehicle had been pointing a video camera at the protestors. But the vehicle had sped away when Hindi tried to get a license plate for the vehicle. After the vehicle pulled up next to his in the afternoon, the protestors and the driver exchanged angry words before the Expedition pulled away. Hindi told his girlfriend Janet Enoch that they should get the person's license plate. Hindi said he followed the SUV while Enoch tried to capture the license plate on video. They followed the SUV through several turns before it stopped on a side street and the driver and another man got out, Hindi said. Hindi and his girlfriend also got out. Enoch said the driver grabbed her and struggled to snag the video camera out of her hands. Hindi said he shoved the man away from his girlfriend and the driver pulled a gun. According to Hindi, the man told the protestors they were “going to regret it now,” and ordered his companion to call the police. However, according to Hindi, the friend convinced the man to get back in the SUV and leave. Hindi and Enoch drove to the police station, saved a copy of the digital video to their laptop and reported the incident to police. They said investigators seized the camera and the laptop. Hindi was angry that police seized the laptop Tuesday night, noting that investigators have the original copy in the camera and he wants his laptop back. District Attorney David Heckler said he didn't know the details of the investigation and that there could be several reasons police seized the laptop and the camera. He said police will likely get the victim's personal property back to them as soon as the investigation allows. A woman at the Warminster police station said police have the newspaper's number and will call when they have something to release. Records indicate no arrest has been made. Less than five minutes after the protest began Tuesday morning, four police vehicles pulled up in front of the pool business, including several officers and a lieutenant. They asked the protestors to move out of the business' driveway and protestors complied. Police incorrectly told the newspaper that a reporter was violating wiretap law by recording public officials conversing with citizens on a public thoroughfare. The reporter told police that his actions were legal because they were standing on a public thoroughfare. Police then said they were requesting that the recordings stop. Later when the reporter attempted to enter the business to ask the owner for comment two officers blocked the reporter's path and said the owner didn't want to comment. They insisted on obtaining the reporter's identification while an officer went inside the business and returned to say that the reporter was not permitted on the property. Pigeon shooting and the protests against it have been contentious. Last year a county assistant solicitor pleaded guilty to harassment after shoving Hindi during a protest in Bensalem outside a gun club. Previously the Humane Society filed charges against the gun club in connection with a wounded pigeon that was left to die, but those charges were later dismissed. Interesting...I was wondering. The reporter he mentioned is from Fox news in Philadelphia and I was scrambling trying to find SHARK contact info for her last night. One has got to wonder, if the police are shooters too. It sure wouldn't be a surprise. I detest these pigeon shoots to the core. And I see nothing wrong with a 'peaceful' protest. I have to say though, in my opinion, Hindi made a real bad judegment call by deciding to follow the maroon car. Tempers were already flaring. By following the car a face to face confrontation ensued, a woman was ultimately pushed and a gun was said to have been drawn. The perfect scenario for a tragic event to happen. I'm just glad it didn't. I agree with you Cindy. I also think about the rage and heartache he must be feeling, after spending the weekend there, documenting the carnage. He must be ready to explode. I don't he could help himself. I agree with you Cindy. I also think about the rage and heartache he must be feeling, after spending the weekend there, documenting the carnage. He must be ready to explode. I don't he could help himself. I'm sure his frustration level was at it's max. However, to follow the car, for whatever reason, is not going to accomplish anything, especially given who was in the other car. Could very well have gotten someone shot. Well..I do understand how following the car was a reaction to the moment. There was not time to think things through. I'm glad they weren't hurt. Well..I do understand how following the car was a reaction to the moment. There was not time to think things through. I'm glad they weren't hurt. Yes!! That was a blessing. It could have turned into a situation where he wished he had taken the time to think things through. After a week and half, the Warminster Police have finally released the illegally seized SHARK laptop computer they physically pulled from SHARK President Steve Hindi's hands. Unfortunately, the Warminster Police are still holding SHARK's video camera. Yes, we are talking Fourth Amendment violations. Anybody know a good constitutional lawyer? See the video the Warminster Police, District Attorney David Heckler and Carlton Pools/Wing Pointe owner Joseph Solana, Jr., didn't want the public to see Here. SHARK would like to thank our supporters for their phone calls and e-mails to the Warminster Township to help put pressure on this issue. SHARK would like to thank Intelligencer/PhillyBurbs/Courier Times reporter Matt Coughlin for his exceptional media coverage of this violent incident so the Warminster Police couldn't hide this from the public. See Matt's latest coverage of this incident Here. SHARK would also like to thank Radio WHP 580 Talk Show Host Bob Durgin for interviewing Steve on his show further exposing the gunman's violent act and fourth amendment violations by the Warminster Police. Special thanks to Bob Barker for making all of this possible with his donation to SHARK to stop the Pennsylvania live pigeon shoots. Fourteen days after having a crazed lunatic pull a gun on SHARK President Steve Hindi, the Warminster Police and District Attorney David Heckler have not issued charges against him, nor arrest him. Instead they have done everything they can do to protect him including the illegal seizure of SHARK's computer and video cam in an effort to hide the truth from the public. Please contact Pennsylvania Governor Tom Corbett and politely request an independent investigation into this violent gun incident and attempted cover-up by the prosecuting authorities.